On Shooter, a 46ft Bertram, you can fish in luxury with a max of 12 passengers. You have a choice of 4, 6 or 8 hour luxury charters all charters on Shooter are private and can be tailored to your specifications to include a stop for a swim with the turtles, lunch on shore, a beach break, etc. Premium bar and lunch included on all charters. The boat has a toilet and air-conditioned saloon. Free round-trip transfers for all charters. Fish in luxury on Shooter - a 46ft Bertram. Can take groups of up to 12. Premium drinks and food provided. Fish in luxury on Shooter - a 46ft Bertram. This price is for up to 10 people and includes transportation to and from the boat, premium drinks, snacks and sandwiches as well as everything you need for fishing. 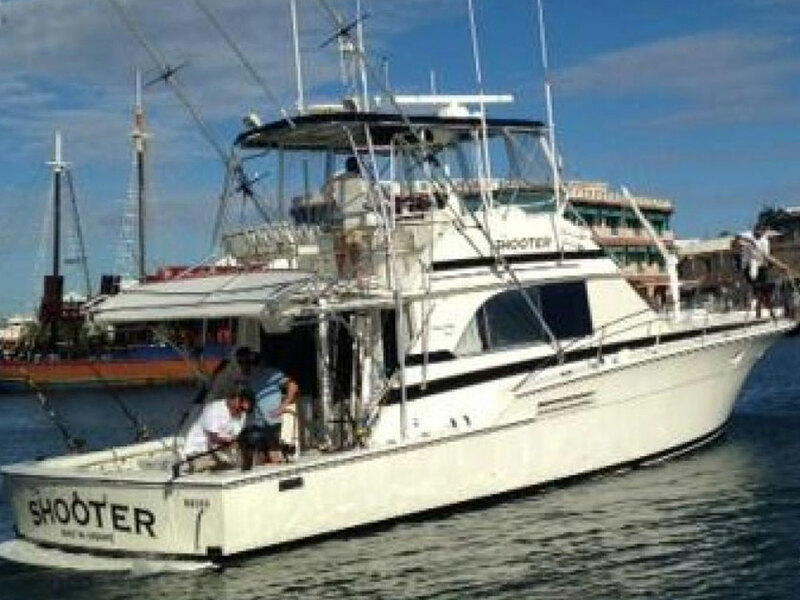 Spend the afternoon fishing aboard Shooter - a 46ft Bertram cruiser. The boat is perfect for large groups, and is the ideal vessel for getting you offshore in search of Mahi Mahi, Wahoo, and other big game species. 6 hour trip that can be tailored to your desires. Fish in comfort. This price is for up to 10 people and includes transportation to and from the boat, premium drinks, snacks and sandwiches as well as everything you need for fishing. Spend a whole day fishing in luxury on Shooter. This price is for up to 10 people and includes transportation to and from the boat, premium drinks, snacks and sandwiches as well as everything you need for fishing.